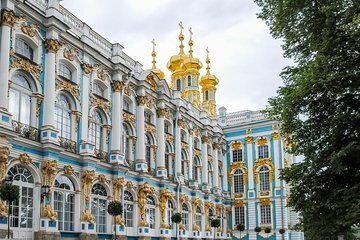 Get a comprehensive overview of the key attractions in St. Petersburg, as well as the summer palaces outside of the city, on this two-day private tour. Your small group enjoys comfortable transportation in air-conditioned car or minivan and the services of a guide who will share an insider's perspective on culture and history of the attractions you visit, which include Peterhof's Fountain Park, Catherine Palace in Pushkin, Peter and Paul Fortress, and Church of the Savior on Spilled Blood. Hotel pickup and drop-off each day is included.